Keep up to date with all the news from the British Dupuytren's Society. First webinar and follow up? 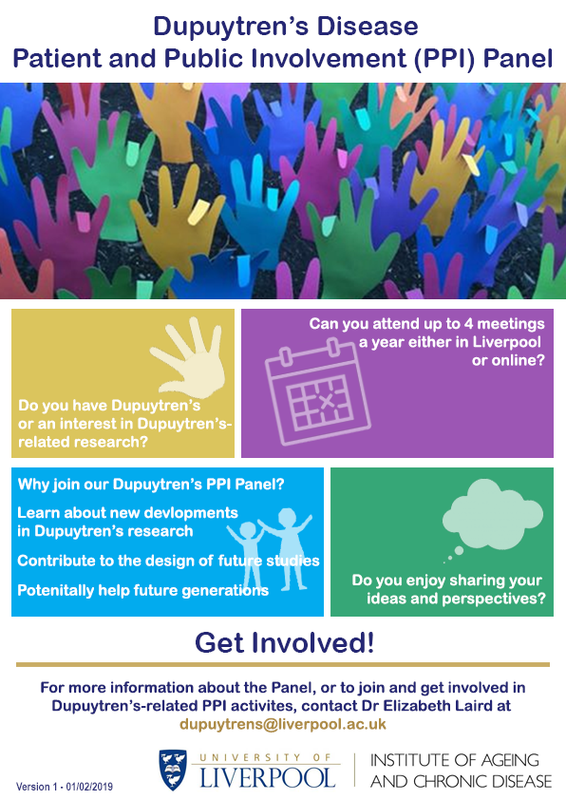 The Liverpool group who are doing research would like more participants for their meetings! If you are interested, look at the poster and contact them or me! The first meeting was informative and pleasant, great to see researchers working on our problem, and lovely to meet other patients. Have a look at the poster. 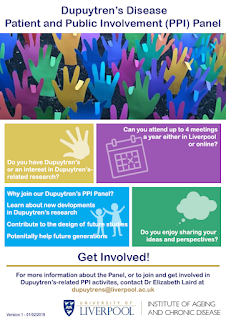 A week ago I was a guest at Liverpool University, attending a patient meeting organised by Dr Elizabeth Laird and Dr Emma Beamish of the Dupuytrens Research Group. They had invited several patients to attend, two via Skype link and the others in person. We heard about the research they have started, hoping to get more clarification in the role of several proteins on developing Dupuytren's tissue. For this they need fresh samples of removed Dupuytren tissue, so they have asked nearby hospitals for help. If any of you is approached to ask to donate their tissue to science rather than to the incinerator, this is your chance to help future generations! Helping researchers helps us all. It was a good meeting, lovely to meet the other patients and very impressive to see the lab where the work is taking place. Fingers crossed for a result that could maybe result in a treatment. Well the webinar has gone well, and we are already thinking of doing more of them! If you want to watch the webinar it can be accessed online. We also managed to have our AGM, it is not an easy feat to get enough trustees online at the same time, as inevitably there will be someone held up in clinic or theatre, another out of the country for conferences and lectures. But we managed. For next year we will continue to support patients as best we can. We are hoping to do another webinar (or two??) and maybe some question and answer sessions on our closed Facebook group. The next Dupuytren Conference, planned for 2020, has been confirmed and will take place in Oxford. This will be a meeting of the top doctors and researchers, and we are very excited about it. As always any help fundraising, organising things or web design and maintenance will be greatly appreciated, just get in touch if you can spare an hour here and there! Meanwhile I hope you all had a good Christmas and wishing everyone a happy New Year, with good health! During the hour Matt Gardiner will control the webinar and we hope all of you will join in the discussions and put your point of view and queries forward. The Audience will be able to submit questions by typing them in and we hope to have some audience voting to keep everything interactive. It will be recorded. A few months ago Prof T Davis honorary professor in Queens Medical Centre,Nottingham University approached the BDS, asking if we were interested in a presentation on Dupuytren's disease in general and the research he is doing. We are now a big step further, and the decision has been made to do the presentation in webinar form (internet based seminar), on Monday 19th November 8-9pm. For now this is meant for UK and ROI members only, as the health system in other countries is very different from ours. This will be using a program called Zoom, if you don't have it on the computer or tablet the viewing part is free and installs more or less automatic if you click on the link to the webinar, which we will send to interested members in due time. I have used Zoom for webinars many times and not had any malware or spam with the program, so I can personally recommend it. The plan is to have about 30 minutes presentation first, then 30 minutes where people can ask questions about the disease or the presentation, and we will have some panel members ready to answer them. We hope the webinar will be recorded so it can be accessed later as well. -Who wants to join- if you do we need your email address to send the link to the webinar. Please let us know if you are interested and what topics you would like. The more people mention a certain topic the better the chance it can be covered. Verapamil gel, used as topical treatment for superficial fibroses in the USA, can now be obtained in the UK. It can be prescribed for Dupuytren's, Ledderhose and Peyronie's. The main use in the US is for Ledderhose, some patients get pain relief and shrinking of the nodules but it does not work for all. Surgery or radiation therapy may still be needed. The paperwork then gets send off to America where a doctor checks it all and writes a US prescription for PD Labs to be allowed to prescribe and mail the product. Three months supply will be the maximum order for each shipment. Total expected cost £540 for three months treatment. As far as we know if this doesn't work (some patients need 6 months treatment to notice the effect, some use it in total for up to a year) radiation and surgery are still possible. How are you most likely to interact with the BDS?